The highly anticipated Atomos Samurai has finally made its way into a number of production workflows. This portable touchscreen 10bit HD recorder, monitor, and playback/playout device captures pristine video and audio direct from any camera with HD/SD-SDI. It encodes in real-time onto low-cost, removable 2.5″ hard disks, directly to ProRes LT, 422, or HQ, at data rates of 100, 145, or 220Mbps respectively. You can then review your footage in real-time onto the pristine 5″ display or out onto any HD-SDI capable device, including directors monitors and broadcast equipment. With up to 10 hours of battery life from the 2 included Lithium Ion Camera batteries, you truly have a deck and monitor in the palm of your hand. Today’s solid-state HD video cameras are capable of shooting some incredible images, but ultimately this quality potential is limited by the compression codec used to save the video to the memory card. Most cameras are using AVCHD, or some other variant of the H.264 codec, to compress the video at a data rate of 24Mbps or less, using 8-bit 4:2:0 color. At first glance, the video playback may look quite good, but scenes with complex detail and high motion can exhibit compression artifacting. And then there?s the issue of color detail. Science has proven that the human eye is much better at seeing differences in brightness, or luminance, than it is at seeing color detail, and that?s why 4:2:0 color is often used, because “no one will really notice anyway.” The problem is that your editing and compositing software WILL notice. When it comes time to do color grading, keying, and compositing, 4:2:2 color produces results superior to 4:2:0, making it much easier to pull a clean key or do precise color correction. On top of that, 10-bit color produces much smoother gradients than 8-bit color. Have you ever tried to color correct a blue sky, only to run into banding issues? 10-bit color gets around this by offering 1024 levels each of red, green and blue, versus just 256 shades with 8-bit color. That?s over one BILLION (1024^3) possible colors versus 16 million (256^3). I know 16 million seems like a lot, but when you get into editing color, 8-bit really doesn?t go very far. Remember in grade school, when it was preferable to have the 64-count box of Crayolas? Same thing. So what if you could take the stunning HD imagery coming into your camera lens, and bypass the negative effects of compression, capturing the full fidelity of the video signal with 10-bit 4:2:2 color as uncompressed QuickTime or the visually lossless Pro Res codec? Today, you have the option to do just that. SSDs are recommended for situations where shock and/or vibration could cause a spinning hard drive to skip. For most applications, the inexpensive laptop drive will work fine. A 500GB laptop drive can hold from 5 to 11 hours of ProRes 1080i HD footage, while a 128GB SSD holds from 77 minutes to 3 hours of HD video. It is important to note capacities will continue to increase while prices move downward, especially for SSD drives, so it will be up to you to evaluate current storage costs at the time you read this. The 5″ 800×480 interface is simple to use, with a no-nonsense, intuitive touchscreen that also doubles as a playback monitor and preview monitor. It definitely has a nice feel to it ? you have to press an icon for a very brief moment – just a fraction of a second really – before it registers, but not so long that it would be considered waiting for a result. Hard to explain, but it just feels right. This helps to avoid accidental changes from less deliberate contact. See the video below for a complete walk-through of the user interface. All in all, the Atomos Samuraiis a dream in today’s tapeless workflows, eliminating the need for capture cards and wasted time logging and capturing. Plus, with support for the Avid DNxHD ® codec on the way, users will have yet another high-quality 4:2:2 codec to work with. 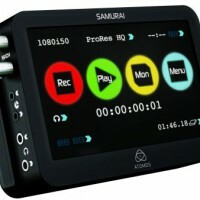 The Atomos Samurai is currently available by itself, or bundled with a 10 in. articulating monitor arm from ikan or 500GB hard drive, only from Safe Harbor. If you have any questions about these products, or video workflows in general, please contact Safe Harbor at (800) 544-6599 and we?ll be happy to assist you. You can also connect with us in the comments below or on Twitter, Facebook, and Google+.